You have to love the name “Mr. Murderbritches” for a bobcat kitten, but I wouldn’t recommend petting him because he might rearrange your face. I also had to search a bit for a non-bloody picture of the little guy, whose images often appear with a chicken that he has just killed, or eating a road-killed deer. This is hardly some cuddle-kitten, but rather a tough little hombre, a wild thing that is truly wild…approach at your own risk! Now Mr. Murderbritches is a 4-to-6-month old bobcat kitten who was first reported by a homeowner in Kanarraville, Utah in their chicken coop, at which time the bobcat hadn’t killed any chickens. He was let out by a sheriff’s deputy, with a live trap set up in case he returned, which he did the following day. Held in captivity for one night, Murderbritches was later released away from the property but again returned, successfully killing and eating a chicken from the coop at that time. Joshua Carver, a conservation officer with the state’s Division of Wildlife Resources, then released the snarling cat back into the wild. Murderbritches then made his way to an isolated property miles away from where he was released, and became stuck in a dog kennel. The conservation officer captured the small wildcat again, feeding him a delicious meal of roadkill deer and eagle-killed pheasant before releasing him again even further away. The badass bobcat struck and hissed at those releasing him, and hasn’t been seen since. The cat was “too mean” for the conservation officer to tell if the animal was male or female at first. a.) A clown that you don’t want performing at a childrens’ birthday party. b.) A new Xmas gift doll for a child that you hate. c.) A new heavy metal band. d.) Trump’s next nominee for Department of the Interior. Aww shucks, you probably all aced the quiz! In the words of Conservation Officer Carver, “I get a kick out of wildlife being wild.” – – Long live Mr. Murderbritches! In a true story, DeDe Phillips, a 46-year-old grandmother living in Hart County, Georgia wandered out of her house with her cell phone in hand to see why a neighbor’s dog was barking. She had just put a “Women Who Behave Rarely Make History” sticker on the back of her new truck. Met with a bobcat, the woman took a picture before the bobcat went for her, targeting her face! Well, when the going gets tough, the tough get going…and knowing that the large feline would go for her upper body, she protected herself by squeezing on its throat. After a pitched battle in which the woman suffered a broken finger and numerous bites and claw wounds to her face, hands, chest, and legs, Phillips managed to strangle the big cat. How very metal of her! She didn’t even call for help because her 5-year-old granddaughter was in the house, and she didn’t want her endangered by coming outside. — This was one granny who could lick her weight in wildcats! Raccoon Climbs St. Paul Skyscraper! I, for one, am generally not keen on “Greatest Hits” episodes of any series as they are usually thinly veiled efforts to repackage old material and stretch out a season. The “Scariest Moments” installment of Mountain Monsters (S4/Ep05) was no different, being essentially a brief synopsis of six different and unrelated previous episodes. I’m not going to comment on the episodes as I have previously posted on many of them. For the sake of reference, however, the episodes covered were on the Hellhound, the Cherokee Death Cat, the Cave Creature, the Bear Beast, the Shadow Creature, and Hogzilla. The summaries provided by these episodes may be helpful to viewers trying to get a brief feeling for the creature involved, or a general sense of what the show itself is about. It can be striking how similar the episodes really are, both in terms of the methods involved, the flow of the action, and the outcomes. In only one of the six episodes profiled was the creature being pursued actually captured, that one, Hogzilla, turning out to be a rather large but perfectly ordinary pig. Not Bad for a Beach Ape! Dang, these Aussie guys are tough! 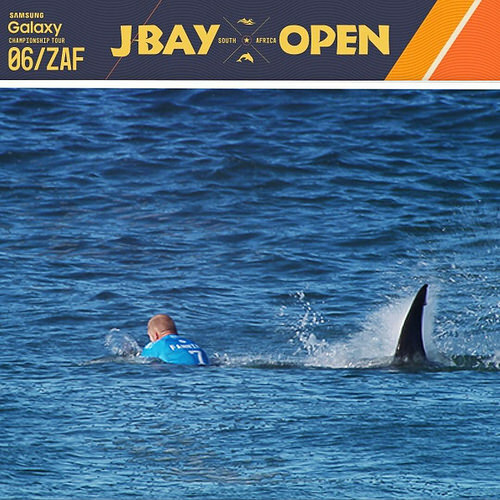 When a cheeky bull shark tried to blindside Australian surfing champ Mick Fanning during a live televised competition, the blighter got a bit more than he bargained for. Spectators thought that they were about to see someone eaten alive before their eyes, but despite being caught off guard and lacking the formidable choppers of his impromptu opponent, Mick slugged the shark in the back and retreated with all of his body parts intact!